Bank Road Closures: Bank Road will be closed between 97th and 100th on Friday at 7:00 PM and will stay closed through the festival. 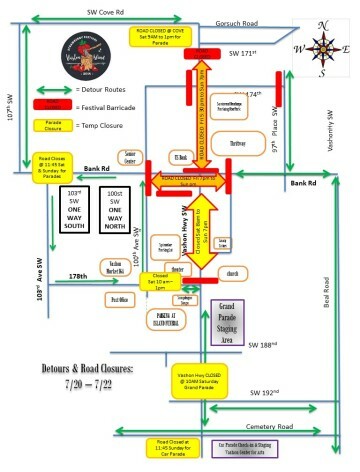 Grand Parade Closures: In preparation for the Grand Parade, Vashon Highway will close on Saturday at 9:00 AM from 178th to 192nd (at Mom’s Deli) until the parade ends at approximately 1:00 PM Bank Road at 100th and 178th will also be closed at 100th during the parade. Sunday Car Parade Closures: Vashon Highway will close at Cemetary Road on Sunday at 11:40 AM for the car parade. Bank Road will close at 103rd, and 178th will be closed at 100th to allow the car parade cars to drive through. Once the parade is over, these roads will open back to the detour route. sponsored by PSCCU & Chris Hunt & Associates. Organizers recommend parking away from the festival and taking advantage of the shuttle and Metro buses. Shuttle stops will have signs, but visitors can wave down the shuttle if they're in a safe place for the shuttle to pull over. THE NORTH END SHUTTLE BUS Runs from 8:30 AM to 7:00 PM on Saturday and 9:00 AM to 6:00 PM on Sunday. The Shuttle will attempt to meet boats, pick up passengers along the way and drop off at Ober Park. Return trips pick up at Ober Park. The last shuttle leaving Ober Park back to the ferry dock will be at 6:30 PM on Saturday and 5:30 PM Sunday. THE SOUTH END SHUTTLE Runs from 9:00 AM to 7:00 PM. The shuttle will meet arriving ferries and drop off visitors at the Vashon Senior Center then proceed to Agren Park and back. Return passenger can catch Shuttle at Senior Center or Chevron at 178th. The last shuttle leaving the Vashon Senior Center for the south-end ferry dock will be at 7:30 pm Saturday & 5:30 pm Sunday. For all shuttles, the cost is $2 each way per person. Children under 5 are free. Please bring exact change. Click here for detour map! The regular Saturday Metro bus schedule will be in service during festival weekend and will follow a detour around town. Times will vary slightly from the regular schedule. Get complete ferry and bus schedules by phone at the following numbers: Washington State Ferries, 888-808-7977, and King County Metro, 206-553-3000. Festival-goers are encouraged to take a shuttle bus from either ferry docks. Those who drive to town will find parking scarce, and many roads to town will be closed much of the weekend (see Road closures). A limited number of disabled parking permits will allow some to park closer to town. Call the Chamber of Commerce at 206-463-6217 to obtain a disabled parking permit. ISLAND FUNERAL SERVICES LOT: Get a great parking spot and support the Vashon Senior Center. Off Street Parking is available at Island Funeral Services. All-day parking is $5. Saturday. People who park at the site are welcome to view the parade from the front lawn, it's a great viewing spot. Access to the parking lot will be via 100th Ave SW. Head South on 100th at the Four way stop by the Post Office, it looks like the road ends, well it does but you drive on grass to get to the lot. Follow the signs.